You may not even think about the importance of maintenance, until a heating or cooling breakdown happens to you on a hot day or a very chilly one. Professionals like Bluflame advise you get your furnace inspected in the fall, and conversely, your air conditioner tuned up in the spring. That way you get ahead of any potential issue that may be lurking, like the need for more refrigerant or a ventilation problem. Safety – It is not safe to get stuck in cold temperatures without the option of heat. Neither is it safe to have a blocked vent, cracked heat exchanger, or dirty burners. This can cause health issues such as carbon monoxide leaks. Lower utility bills – By keeping your unit as up-to-date as possible, you will have a furnace that can run smoothly without any possible build-up that will alter the heating system from performing at its peak when you need it the most in the winter. The more build-up a system has, the harder it has to work. When you need repairs, your home energy bill will increase because your heater is working overtime to maintain even basic functioning. Studies show that routine maintenance can save up to 20% on heating and cooling bills. A furnace tune-up pays for itself with the money saved during winter heating season. Saves you from costly repairs – When we maintain your furnace in the fall, we save you from the hassle of an unplanned breakdown. Small repair issues can lead to larger issues that are more expensive than annual maintenance is. Professional technicians will identify if your furnace needs a repair and will handle it on the spot. Do not wait for your furnace to break down. Preventative care is safer and cheaper. Prolong the life of your system – By scheduling a furnace tune-up every fall, you can increase the lifespan of the unit by 30-50% or more. The average life expectancy of a furnace is around 12-20 years; if not maintained, it may not even last 10 years. With professional maintenance by Bluflame, you can easily double the lifespan of the average furnace. Compared with the price of a new furnace, annual service is a no-brainer. Keeps system running as efficiently as possible – By having routine maintenance tune-ups, you can increase the efficiency of your system upwards of 25%. In addition, efficiency means your system is being energy-efficient and cost-effective. This is good for your wallet and the environment. 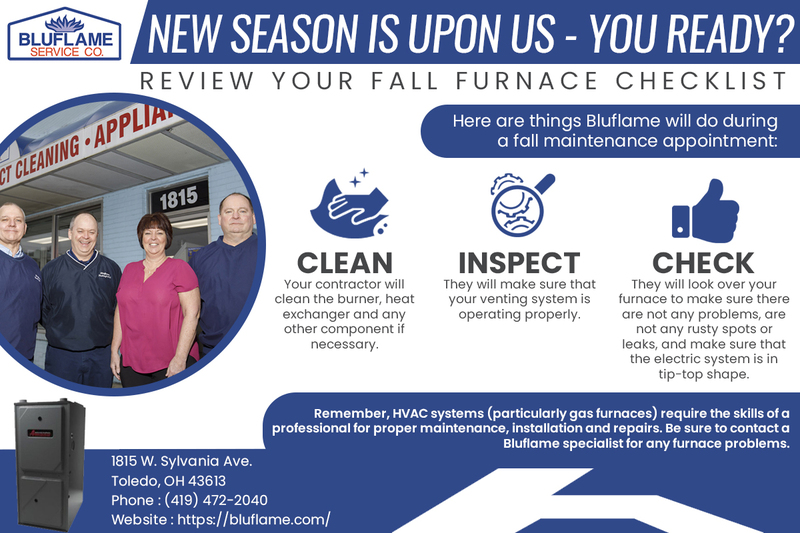 Save money, energy, time, and frustration by scheduling fall furnace maintenance with Bluflame. Contact today to schedule your fall maintenance.